Canine Companions for Independence, an organization that works to provide assistance dogs to people free of charge, has expanded to the South Plains. 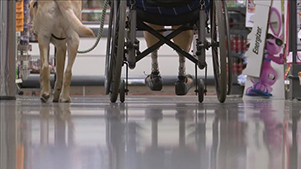 They train the dogs in more than 40 advanced commands to help people with disabilities with everything from closing drawers and turning off lights, to alerting help. Puppy raiser Julie Wilson's first success story, Georgina, is about to graduate from basic training, just in time for International Assistance Dog Week. Now, she's starting to train her next puppy to help others. "I'm so inspired by their courage. I love what these dogs mean to them and how much independence they give them," Wilson said of the assistance dog recipients, or "graduates." Chelsey Price, one of the graduates, lost both of her legs fighting a bacterial infection in 2010. "I kind of, like, retreated. Going out was hard. Going anywhere was a task," Price said. "You have to re-learn everything. You learned it all once as a child, but now you have to re-learn it at 25 or 30 years old. It's a traumatic experience." That was before Pablo came along. Now, he comes along everywhere, helping her at the mall, the grocery store and even at home. "In a wheelchair, you have to navigate your room in the dark. So, I can get in bed and then have him go turn off the lights now," Price said. Price and Pablo are a team, she said, even calling him her "wheelchair." "Now, it's fun. I don't 'have to' go to work. I 'get' to," Price said. Price added, the Canine Companions organization was like like a team cheering her on, as well. Wilson couldn't agree more. With no formal dog-training background, she said she'd recommend becoming a puppy raiser to anyone who simply believes in the mission. "It's rewarding to see a puppy go from this stage where is really is just a blank slate, to where Georgie is right now," Wilson said. "Then, when you get to meet the graduates, the people receive these dogs, and hear the stories about how they changed their lives, that is what keeps me hooked." Canine Companions is always looking for puppy raisers and volunteers. They also want to encourage people who identify with Price's story to apply to become a graduate.